South Africa: 2019 National Elections - Which Parties Are Fighting for Your Vote? Patricia De Lille to Change South African Politics for Good? IEC voting station (file photo). Forty-eight political parties are expected to contest the national elections on May 8. According to Sy Mamabolo, chief electoral officer of the Electoral Commission of SA (IEC), this is 19 more than the number of parties that contested the 2014 general elections. The various parties signed the IEC code of conduct in Gallagher Estate in Midrand on Wednesday. "The code holds contesting parties and candidates to a code of behaviour intended to promote conditions that are conducive to free and fair elections and creating a climate of tolerance, free political campaigning, and open public debate. It is in effect from the day of proclamation of an election until the announcement of results," the IEC said in a statement. 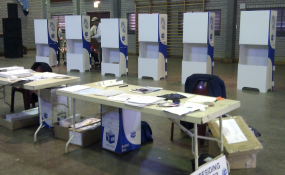 The IEC says there is a record number of parties contesting the provincial elections. Gauteng has the largest number of parties contesting at 36. Western Cape and Limpopo come second with 34. KwaZulu-Natal has 31 parties contesting the provincial elections, while the North West has 29 parties. Mpumalanga and the Free State have 28 parties each. The Eastern Cape has 26 parties taking part while the Northern Cape has the smallest number at 21.